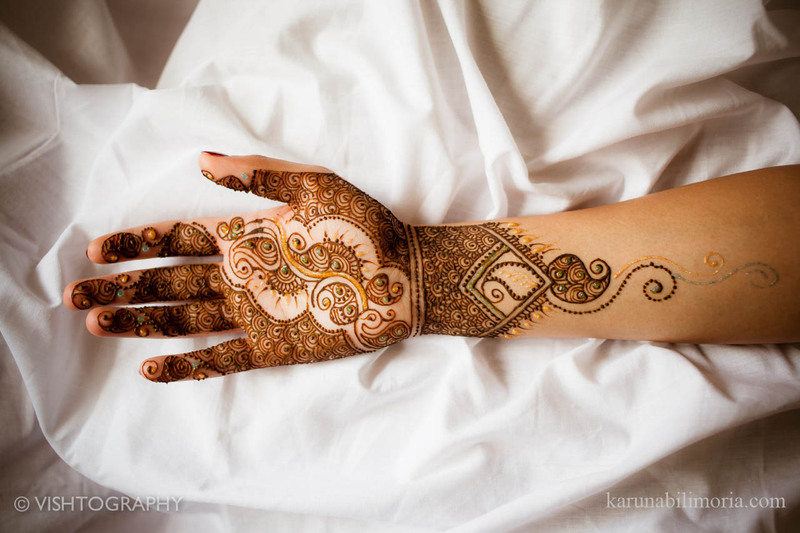 Karuna Bilimoria is based in Harrow, UK and has been applying mehndi from the age of 10. Here is a qualified beauty therapist and OPI nail technician who got into the field of mehndi design just by chance. Her’s is a very interesting story. Read on to find out more. (In case if you’d like to see the other interviews with mehndi artists, click here, here, here, here,here,here, here and here). 1. 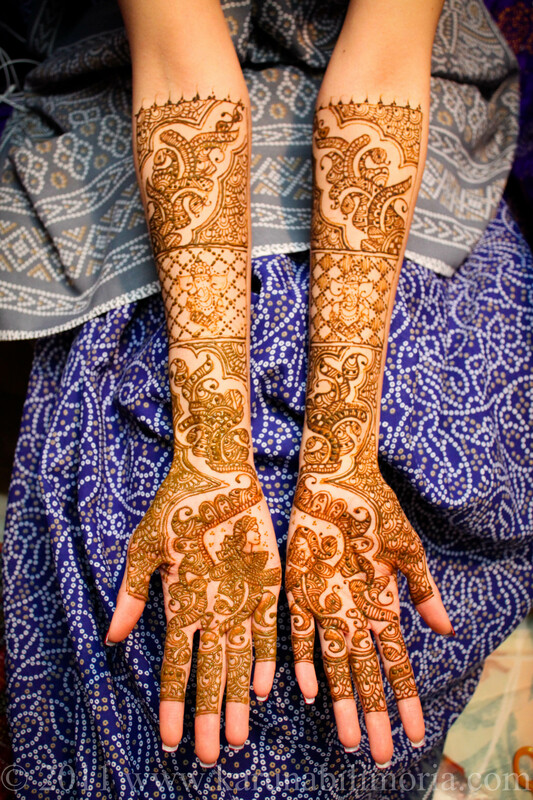 Tell us about yourself – when did you begin applying mehndi design and how did u think of getting into this line. I began applying mehndi 14 years ago, at just 10 years old. It all started when my grandma was visiting from India, and she brought some henna cones with her. She asked me to do some on her & I had never even held a henna cone before, but she talked me through what to do and how to hold it and it progressed from there. Ever since that day, I knew this is a skill I wanted to perfect, so I made sure I practiced – be it on paper or on my family and friends. I began taking requests for wedding from friends and family via word of mouth, and my business grew from there. I wanted to offer nail and beauty treatments alongside henna, so I did an NVQ 2&3 beauty therapy course as well as an OPI foundation course and I am now a fully qualified beauty therapist and OPI nail technician. My website launched in Dec 2011 and this is when I began to put my name out there in the industry, specializing in bridal nails and henna. The passion for my job grows more and more each day and I am so thankful for where I am at right now and what I have achieved so far! 2. 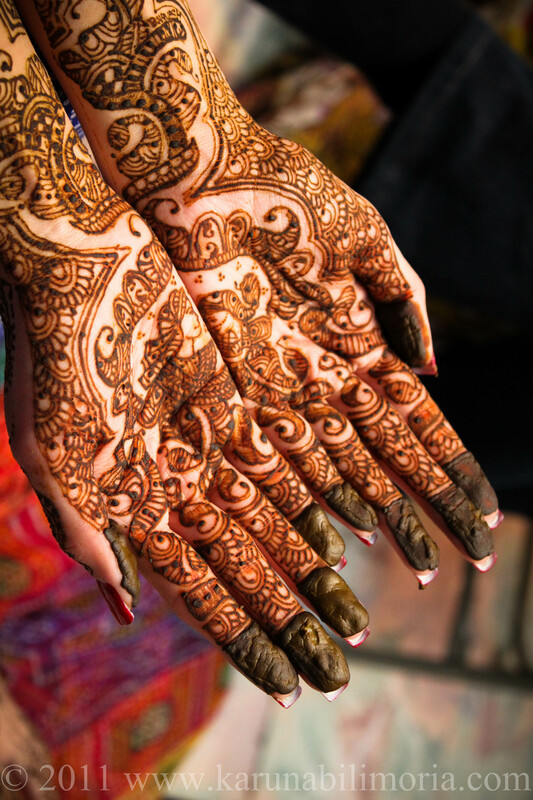 What are your top favorite mehndi design? It is hard to tell which mehndi design is my absolute favorite! I love all styles of henna, but I can say my specialty is fusion bride and groom designs. All of my designs are based on the clients’ requirements. I actually draw out each pattern on paper first so the bride is 100% happy with it before the big day. The most popular of my designs would have to be a bride and groom pattern I did in 2011. This has been the design that most patterns have stemmed off of, as a starting point for most brides. 3. Most memorable experience you had while doing mehndi design – something that has stayed close to your heart and is remembered very fondly? I have lots of moments which I remember that are special to me. I love the time I get to spend with my brides – but to name a recent memory it would have to be the day I was applying henna with my team in the beautiful city of Rome, Italy. We were lucky enough to take in such a romantic and amazing atmosphere and it was a really enjoyable experience! The most important tip is to use only fresh, safe and natural henna. I always say to leave the henna on for a minimum of 6-8 hours, this way, the dye will have enough time to penetrate deep into the skin. When removing the mehndi, it must be flaked off and not touched with water for a minimum of 24 hours – this is also very important. It will reveal a light orange stain and gradually turn darker through the hours of each day, and end up in a dark rich burgundy stain. Throughout this whole process it is so important to keep the area warm, as heat will generate a much darker stain. To moisturize, you can use coconut oil, olive oil and even Vicks Vapour rub! Never apply any petroleum based products, as this will break down the stain and aid it to fade much more quickly. The best way to reach me will be via the website or via email info@karunabilimoria.com. I do this full time, and am open to travelling nationally & internationally! You can find me on Facebook here and follow me on Twitter too. (Published with permission of Karuna Bilimoria. Please don’t use these images without permission from the original source).Click on the image to view them larger.